A tasty surprise for those who love fries. Spray a cookie sheet with nonstick cooking spray. Place potato wedges on the cookie sheet. 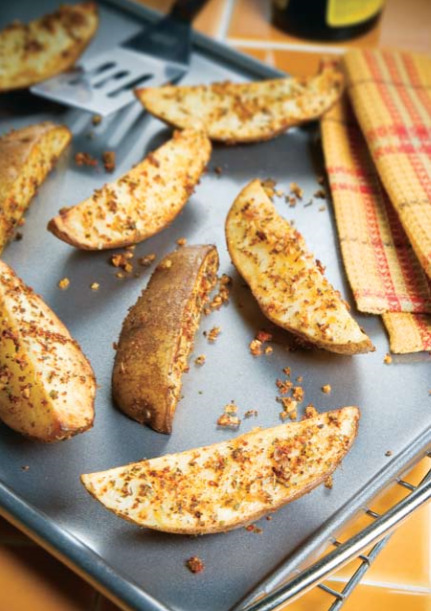 In a small bowl, combine garlic with seasonings and sprinkle ½ of the mixture over the top of the potato wedges. Bake wedges for about 7 minutes or until they start to brown. Flip wedges over. Sprinkle with the remaining mixture, and bake for another 7 minutes or until the wedges are browned and cooked through.